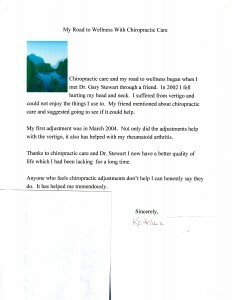 Chiropractic care and my road to wellness began when I me Dr. Gary Stewart through a friend. In 2002 I fell hurting my head and neck. I suffered from vertigo and could not enjoy the things I use to. My friend mentioned about chiropractic care and suggested going to see if it could help. My first adjustment was in March 2004. Not only did the adjustments help with the vertigo, it also has helped with my rheumatoid arthritis. Thanks to chiropractic care and Dr. Stewart I now have a better quality of life which I had been lacking for a long time. Anyone who feels chiropractic adjusments don’t help I can honestly say they do. It has helped me tremendously.